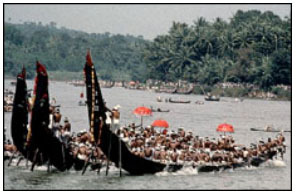 Represented in this picture is an example of the “Snake Boat” race for which, the south Indian state of Kerala is fast becoming popular. The long boats, operated by oarsmen selected for their strength and endurance as well as athleticism, compete in ritualized racing events annually. The most famous of these boat races is the “Nehru Trophy Boat Race”, named after the first Prime Minister of India, Jawaharlal Nehru. Many visitors make the trip to Kerala to witness such races. Besides the Boat races, Kerala is becoming a prime destination for tourists from abroad, especially Europe but also from the wealthy from other parts of India. Another major attraction is journey through the “back waters” (the canals and lakes) that are abundant in this small patch of lush land along the western coast of South India. The newest craze in Kerala is renting the so-called “House boats”; these boats, constructed of wood in the fashion of a small house are staffed by an operator and at least a cook. Food is prepared for the occupants on the boat, usually from freshly caught fish and shell fish. The boats are becoming bigger and luxuriously outfitted and air conditioned. Kerala state has many distinctions. This small south Indian state boasts a100% literacy rate, the lowest infant mortality in India and the longest life span (around 70 for men and 78 for women). As the beneficiary of the full impact of the southwest monsoon, Kerala is also blessed with lush vegetation. The name Kerala itself is derived from coconut tree (Kera means coconut and Kera-la means land of coconuts.